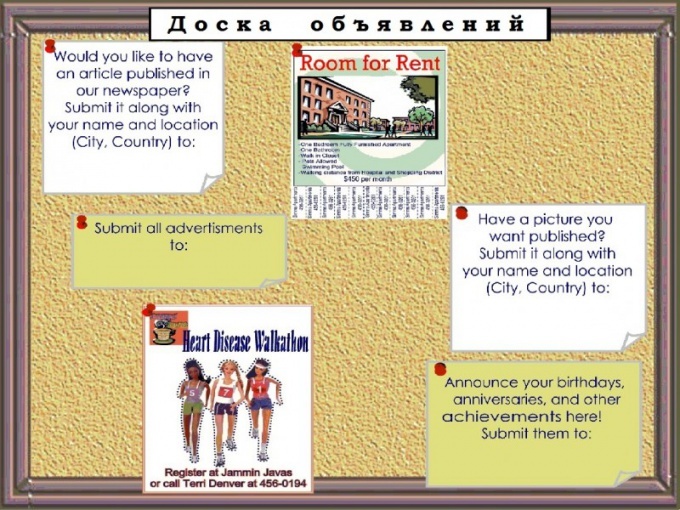 Bulletin Board, posted in a prominent, heavily trafficked place in the organization is not only a great way to communicate to all staff the latest news, information and order guides, but also an indicator of a certain corporate culture. You must know how to arrange the Board so that this corporate culture the outsiders who applied to your company a positive impression. Structure area of the surface of the ad so that it was visually divided into clear sections, each devoted to a specific topic. This facilitates the use of it and those who seek information do not have to read all the posts. Can appeal to any section. Make the headings themselves are informational messages in the same style. Well, if it will match the overall corporate style of the company. It is appropriate to use uniform logos and colors, even fonts. Don't turn this into an informational booth similar to those on which hang ads about the missing dog and the apartment. Each message should have its place and not to obstruct the new "layers" of information. Matter which way will be attached information on the Board. Better to abandon the standard fixed "pockets", they are not very comfortable, if the size of the ads will be different. If it is not contrary to the strict and formal style of your company, then attach them with special clips or paper clips. In this case, the very Board it is better to order from tube to the needle didn't leave a trail. Consider whether or not to place a single stand long ads and those that are relevant for a short time. If, nevertheless, it makes sense, then group the place for messages on these signs. But given the fact that the information stands of smaller size appear to be better, it makes sense to post this information on a different Board. Most importantly – assign the employee responsible for updating information materials presented on the blackboard announcements and their design in accordance with the chosen style and standards. Better if it will be immediately brought to the creation of this stand. All messages that anyone wants to put on the Board, should be mandatory agreed with him. This situation can even issue the order.